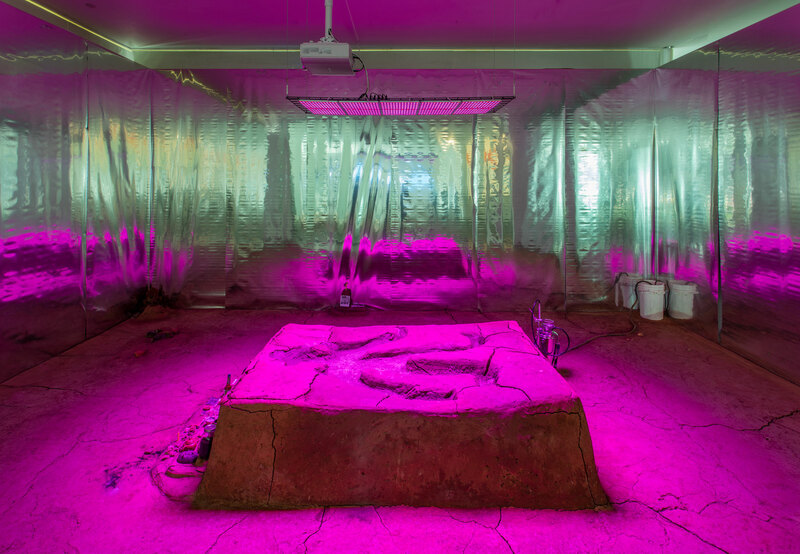 Candice Lin draws from multiple disciplines to unearth largely forgotten or disregarded histories and to highlight practices that have been marginalized or discredited. She has created large-scale installations of elaborate systems in which fluids—such as kombucha or water dyed red with pigment from the cochineal insect—are drawn through tubes connecting an assortment of vessels or diverted to a surface where they pool into large stains. Her interest in the legacies of colonization and the attendant fictions relating to authenticity, purity, and birthright has led her to explore how specific natural materials and goods are given value and how they circulate through global trade routes. 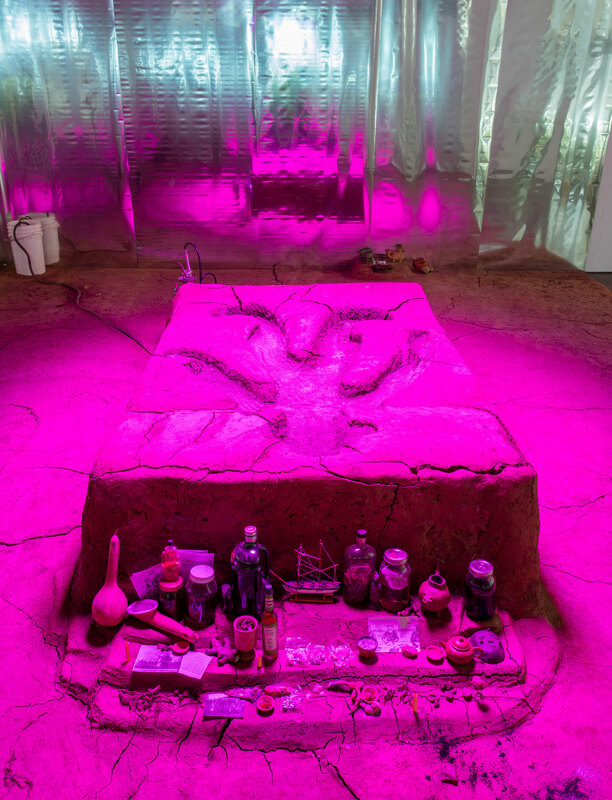 Her installation for Made in L.A. 2018, La China Charada, is composed of an earthen floor mixed with red clay, cement, seeds, and guano. 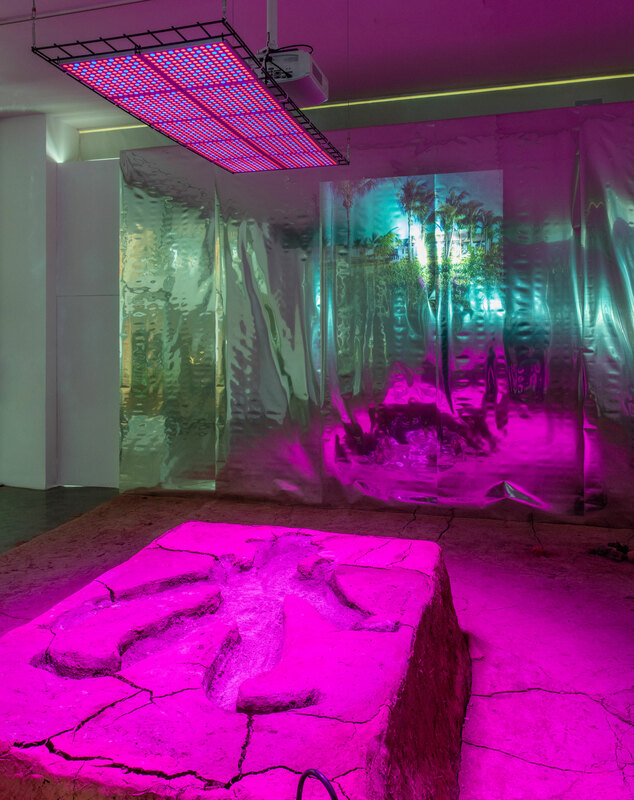 This earth surrounds a raised platform containing a human silhouette, which has been embedded with the seeds of opium poppy, sugarcane, and poisonous plants from the Caribbean. Grow lights and a rudimentary irrigation system are intended to cultivate growth. These plants connect the history of the Opium Wars in the nineteenth century (which resulted in drug addiction, unfair trade practices, and political unrest in China) with the use of poisonous plants in slave and worker uprisings. The materials reference histories of imported Chinese laborers, including coolie laborers who worked alongside African slaves on sugar plantations in the Caribbean and in Louisiana; cement production in Cuba and California; and guano harvesting in Peru. The shape of the Charada China figure in the center is inspired by a Cuban- Chinese gambling game and syncretic magic ritual that was used to distribute wealth within the Chinese community. The work also calls attention to the suppression of a historically significant event in which over 200,000 Chinese people were forcibly brought to the Caribbean from 1847 to 1874. La China Charada explores how this forgotten history might be understood amidst current discussions about the migration crisis and ongoing concerns over human trafficking and labor conditions. Candice Lin (b. 1979, Concord, Massachusetts) works in Altadena, California. She received her BA in both visual arts and semiotics from Brown University, in 2001, and MFA in New Genres from San Francisco Art Institute, in 2004. Her work has been exhibited at Portikus, Frankfurt (2018); Moderna Museet, Stockholm (2017); Bétonsalon—Center for Art and Research, Paris (2017); Human Resources, Los Angeles (2017); New Museum, New York (2017); SculptureCenter, Long Island City, New York (2017); Los Angeles Contemporary Exhibitions (2016); and Vincent Price Art Museum, Los Angeles (2013), among others. She is the recipient of several residencies, grants, and fellowships, including a California Community Foundation Award (2014), Fine Arts Work Center Residency (2012), Frankfurter Kunstverein Deutsche Börse Residency (2010), and Smithsonian Artist Research Fellowship (2009).